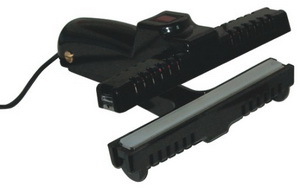 6" direct heat sealer equipped with two heated seal bars 15mm wide. Perfect for sealing polyethylene and polypropylene up to 6 mil thick. The upper jaw holds the metal sealing bar and is covered with a PTFE cloth. The bottom jaw holds the resilient silicone rubber. Has temperature controller for ease of use. 2. On / Off lighted switch..
3. Lightweight and easy to grip.